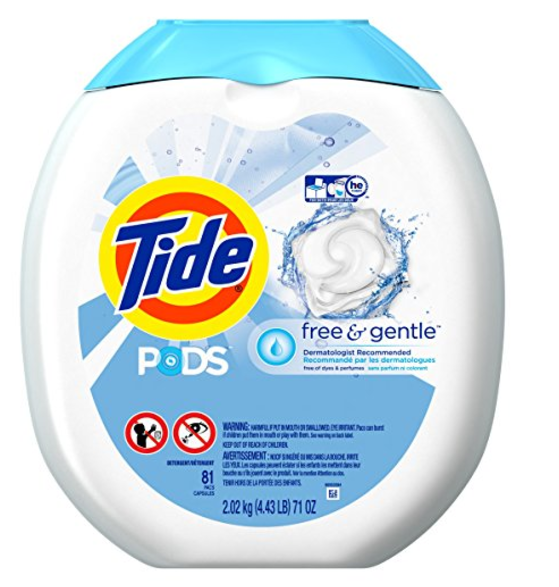 Right now you can get Tide PODS Free & Gentle HE Turbo Laundry Detergent Pacs 81-load Tub for just $13.04 Shipped when you clip the $5 off coupon and subscribe and save! That's just $0.16 per load! -Hypoallergenic. Dermatologist Tested. Free of dyes and perfumes. -3-in-1 laundry pacs: detergent, stain remover, brightener. -Each pac of Tide Pods Free & Gentle provides a deeper clean (versus the leading Free detergent) that's gentle on skin. -1 laundry pac for medium loads, 2 pacs for large loads and 3 pacs for extra large loads. -Tide PODS laundry pacs dissolve quickly in hot & cold.